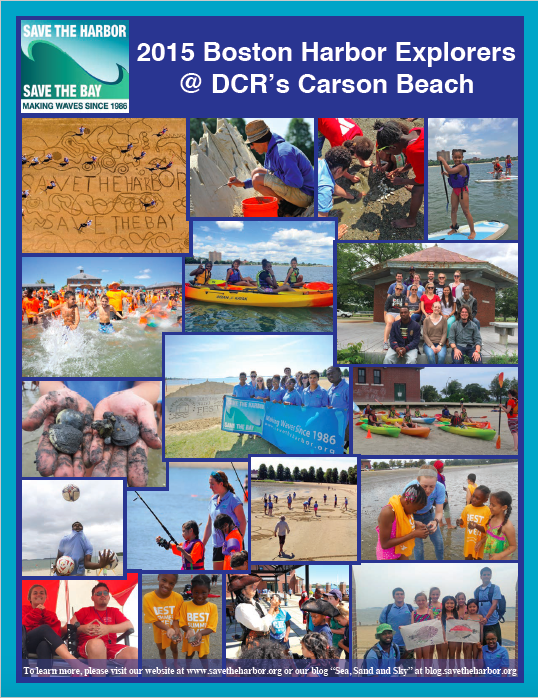 Join Save the Harbor/Save the Bay, The Department of Conservation and Recreation, and the South Boston Neighborhood House this summer for a day – or days - of healthy outdoor activities and youth environmental education and enrichment programs on the cleanest urban beach in the nation! Who: This free program is open to youth development and community groups serving kids of all ages. However, some activities such as aquatics, kayak and standup paddle board instruction have age restrictions and require reservations and waiver forms signed by a parent or guardian. What: Boston Harbor Explorers @ DCR’s Carson Beach is a free program that offers youth development and community groups the chance to enjoy a free field trip to the beach. Onsite activities include fishing, clamming, and environmental exploration, soccer, volleyball, and kite flying, storytelling by the sea, and art on the shore. We also offer paddle board, kayak and swimming and aquatic safety instruction, as well as activities that strengthen STEM skills and teach young people about Boston Harbor, the tide and the marine environment. 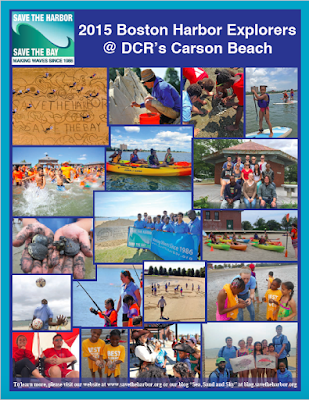 When & Where: Boston Harbor Explorers @ DCR’s Carson Beach runs Monday – Friday from 9:30 – 3:00 at the Edward J. McCormack Bathhouse at Carson Beach on Day Boulevard in South Boston from July 5 to August 26, 2016. 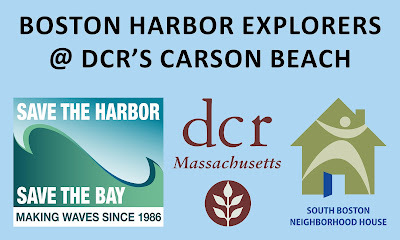 How: If your organization would like to take part in Boston Harbor Explorers @ DCR’s Carson Beach this summer, please contact our Site Supervisor Bridget McGrath by email at bmcgrath@sbnh.org or on her cell at 1.617.755.8928. Free lunch is available on site. There are lots of great things to do on the beach every day. However, some activities such as aquatics, kayak and standup paddle board instruction are not available everyday, and are available on a first come first served basis, have age restrictions and require reservations and waiver forms signed by a parent or guardian. Download July's calendar. Download August's calendar. Free Stand Up Paddleboard Lessons are available on Tuesdays, Wednesdays and Fridays. Contact Stacey Mac at SUP Sonas by email at supsonas@gmail.com or by phone at 1.707.847.6627. Free Kayak Instruction is available on Thursdays and Fridays. To make reservations please contact our Site Supervisor Bridget McGrath by email at bmcgrath@sbnh.org or by phone at 1.617.755.8928. Free YMCA Swim and Aquatics Lessons are available on days when the tide is high. You can find a schedule on our blog Sea, Sand & Sky at http://blog.savetheharbor.org. For reservations, please contact Jeremy Stiles by email at jstiles@ymcaboston.org or by phone 1.617.286.1236. See you on the beach this summer! You can make a contribution to support our work here. The Metropolitan Beaches Commission held a regional public hearing on the state of the Metropolitan Region’s public beaches in Revere, Winthrop and East Boston on Tuesday evening, June 7th from 6:00 pm – 8:00 pm at the Jack Satter House, 420 Revere Beach Boulevard in Revere. Metropolitan Beaches Commission Co-Chair Senator Thomas McGee of Lynn, who has served on the Commission since its inception in 2007 and Co-Chair RoseLee Vincent of Revere hosted the hearing, where more than 60 residents of Revere, Winthrop and East Boston shared their thoughts about how to improve their beaches. MBC Commissioners State Rep. Adrian Madaro of East Boston, State Rep Brendan Crighton of Lynn, Robert Tucker of Lynn, Barbara Bishop of Winthrop, Kathi-Anne Reinstein of Revere, Doug Gutro of Quincy, Mounzer Aylouche of Swampscott, and Senator Joseph Boncore of Winthrop were on hand to hear frothe public and sharetheir thoughts as well. 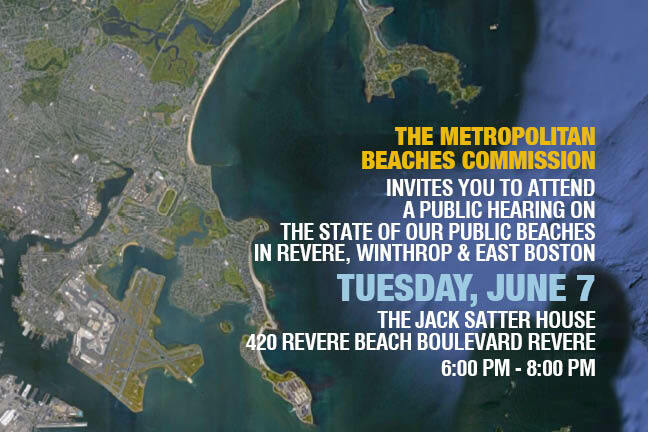 The Metropolitan Beaches Commission is comprised of elected officials and community, civic, nonprofit, and business leaders from Boston and the metropolitan region’s waterfront neighborhoods and beachfront communities. You can make a contribution to support Save the Harbor's work here. My name is Hannah Lynn and I’m interning at Save the Harbor for the summer of 2016! 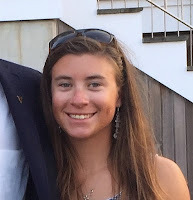 I am a rising senior at Boston College where I study environmental geoscience. I grew up in Marblehead, MA and spent my entire life around boats and beaches, so I have a strong passion for the ocean, particularly around Boston Harbor and the North Shore. Studying geoscience has given me an in-depth understanding of the chemical and physical processes that govern the ocean and the environment, so I hope this internship will give me more insight into the policy behind the issues. As a member of the BC sailing team, I spend as much time out on Dorchester Bay as I do in class, and every day it furthers my appreciation for the unbelievable natural resources we have here in Boston. I have also spent the past few summers coaching sailing at Pleon Yacht Club in Marblehead, where I myself learned to sail. 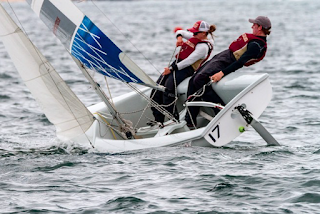 More recently, I was elected president of the New England Intercollegiate Sailing Association, and I represent the New England conference in the national governing body of collegiate sailing. Aside from sailing, I love skiing, hiking, and all things outdoors. I am so excited to be a part of the Save the Harbor team this summer and contribute to all the great things happening here! Arbella Insurance Group Charitable Foundation, Inc.
JW Capital Partners & SKW Partners, Inc.
Kearney Donovan & McGee, P.C. John J. McGlynn, Jr. Esq. & Diane McGlynn, Esq. Eleanor & Duncan MacQueen, Jr.